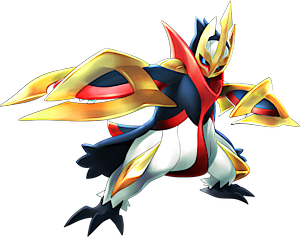 Mega Empoleon in game: 121 Who? Important notice! Pokemon Mega Empoleon is a fictional character of humans. 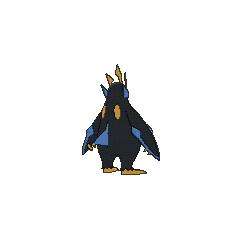 Empoleon (Japanese: ????? Emperte) is a dual-type Water/Steel Pokémon introduced in Generation IV. 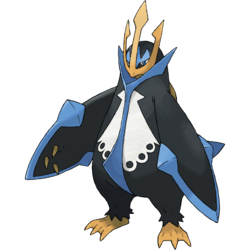 Empoleon is a large, navy blue, penguin-like Pokémon. It has a wide, yellow beak with three pointed horns that form a trident-shaped crest and small, blue eyes. Large horns are a symbol of leadership and strength for Empoleon. There is a blue marking resembling a crown over its eyes and a white, lacy marking running down its chest. A blue, fin-like projection forms a collar around its throat and runs down the length of its chest and belly. On its back are two raised, gold bumps and a second blue fin that forms its tail. It was wide, flipper-like wings rimmed with blue along the tips and three golden claws. The edges of these wings can slice through ice floes, and this Pokémon will use them to attack anyone or anything that damages its pride. Its yellow feet are webbed with three toes each. Empoleon made its TV debut in Barry's Busting Out All Over! under the ownership of Barry. 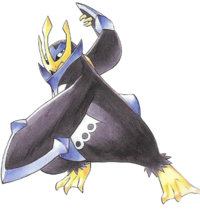 Empoleon made its debut appearance in The Rise of Darkrai, under the ownership of a Coordinator named Kai. It was used in battle against Dawn's Piplup, and also tried to stop Darkrai together with Allegra's Infernape and Maury's Torterra. It was later used in the Battle Stage of the Alamos Contest. Platinum owns an Empoleon that evolved in the Veilstone Department Store while her two companions and the bodyguards assigned to protect her were fighting off Team Galactic. This Empoleon then proved to be an invaluable ally in the Pastoria Gym challenge, and has continued as an integral part of her team. 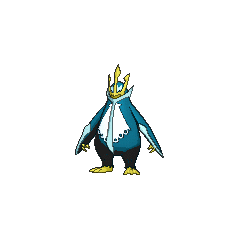 In Pokémon Diamond and Pearl Adventure!, Hareta owns an Empoleon that evolved after the effects of the Everstone Mitsumi gave it wore off, which caused Piplup to evolve straight into an Empoleon, only being Prinplup for a moment. His Empoleon was valuable in the Mt. Coronet battle and risked its life to stop Cyrus. Empoleon has ten type resistances, due to its Steel-type qualities, the most of any starter Pokémon. Empoleon can learn seven HM moves, only excluding Fly, in Generation IV, the most of any starter Pokémon. Empoleon is based on an emperor penguin and an emperor in reference to its crown and royal appearance. Also, the crown has the appearance of a trident, a fishing tool. It also bears some resemblance to the royal penguin.